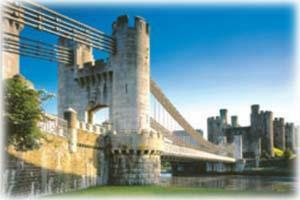 Elegant suspension bridge and toll-keeper's house adjacent to Conwy Castle. 2019 Prices: Adult £1.70, Child 0.85, Family £4.70. A55 Junction 18 & A546/A547 to Conwy; follow signs to car parking.